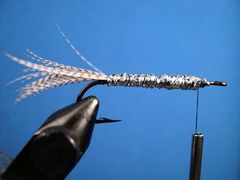 The Super Silver Minnow is featured in "Fly Tying and Fishing for Panfish and Bass" by Tom Keith. Tom says that it is an excellent minnow-imitating pattern for Crappie and other gamefish. Here is how I tie it. 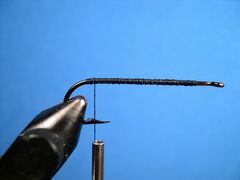 I use the Mustad 9674 4X long hook but you could substitute the Mustad 9672 or any other 3X or 4X long streamer hook. I prefer to use Mallard flank feathers for the tail and overwing but you could substitute Mallard breast feathers. The Materials List stipulates .025 dia. lead wire but use any size that suits you. I like to use the heavier wire to help sink the fly quicker. The Materials List also stipulates the use of Diamond Braid but you could easily substitute any silver tinsel for the same effect. In fact, the original recipe calls for the shank to be wrapped with floss and then covered with flat silver tinsel. I elimated that step and opted for Diamond Braid which makes for a slightly fuller body. 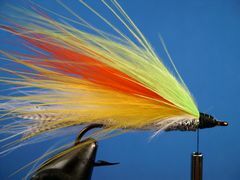 As streamers go, this fly is not a complicated fly to tie. However, there are two steps in the tying process that need special attention. The first is the amount of marabou to use. 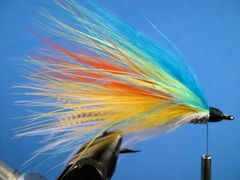 For each color of marabou, strip the fibers from one side of the plume. Don't use the entire plume. In this case "less is more." Secondly, use a flank feather for the overwing that has a straight stem. It pays to sort through a pack of flank feathers to find a feather with as straight as stem as possible. Author and Super Silver Minnow originator Tom Keith says that the Silver Minnow is an excellent minnow-imitating fly that he tries to make imitate a crippled or wounded minnow. Tom recommends a slow erratic retrieve close to Crappie holding cover like partially submerged trees and weed beds. He also recommends retreiving the fly at various depths until a school of Crappie are found. I would recommend that the Super Silver Minnow be attached to the leader tippet with a loop type knot that allows the minnow to be more animinated and therefore appear more life-like. If you are not familiar with how to attach flies to your tippet with a loop knot, click on "Warmwater Knots." Tom further reminds his readers in "Fly Tying and Fishing for Panfish and Bass" that the Super Silver Minnow is also effective on Largemouth and Smallmouth Bass, Walleye, and Northern Pike. Attach the thread one-quarter of an inch from the hook's eye as shown and cover the shank back to the bend with close wraps of thread. 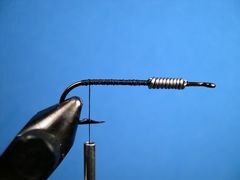 Wrap some lead wire for weight at the front of the hook. The size of the lead and the number of wraps is your call. 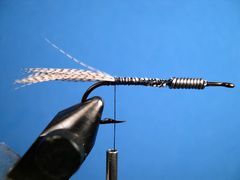 Strip some fibers from a flank feather for the tail and tie them in at the hook's bend so they extend about half of the hook's length beyond the bend. Attach a three-inch piece of Diamond Braid directly in front of the tail. 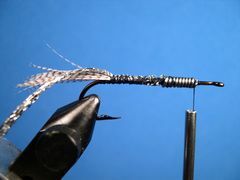 Wrap the Diamond Braid forward and tie off one-quarter inch behind the hook's eye. 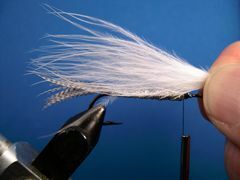 Strip or cut the fibers from one side of a white marabou plume and measure them against the fly so that the fibers extend slightly beyond the tail. 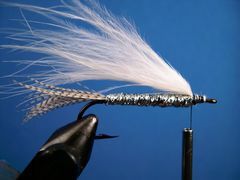 Tie the white marabou fibers in as shown so that they extend slightly beyond the tail. 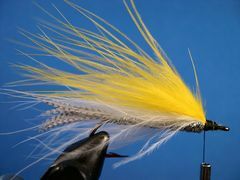 Strip the fibers from the side of a yellow marabou plume and tie them in so that they are the same length as the white marabou fibers. 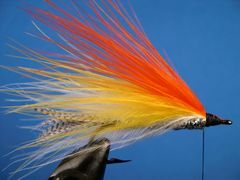 Repeat the same procedure with a clump of fibers from an orange marabou plume. Repeat the same process with a clump of chartreuse marabou. Finally, add a bunch of fibers stripped from the side of a blue marabou plume and tie them in and the underwing is fininshed. 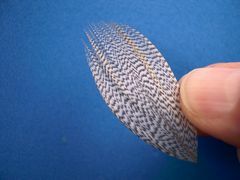 Select an appropriate Mallard flank feather for the overwing and prepare it to tie in by stripping away the fluff from the base of the stem. 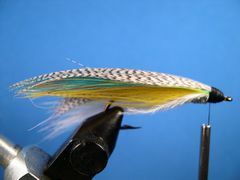 The feather should be long enough to cover the marabou underwing and preferably it should be slightly cupped. Also, note that the that the feather should have an equal amount of fibers (barbules) on either side of the stem. Tie the overwing in on top of the underwing as shown and form a neat thread head. Tie off the thread with a two half-hitches or a whip finish and coat the head with cement. I prefer Sally Hansen's "Hard As Nails" nail polish for head cement. And, your Super Silver Minnow is finished.